This example show how to animate a moving bitmap along path. where pos, and tan are float passed to retrieve the resulting position and tangent. /res/layout/activity_main.xml, simple include our custom view in layout. 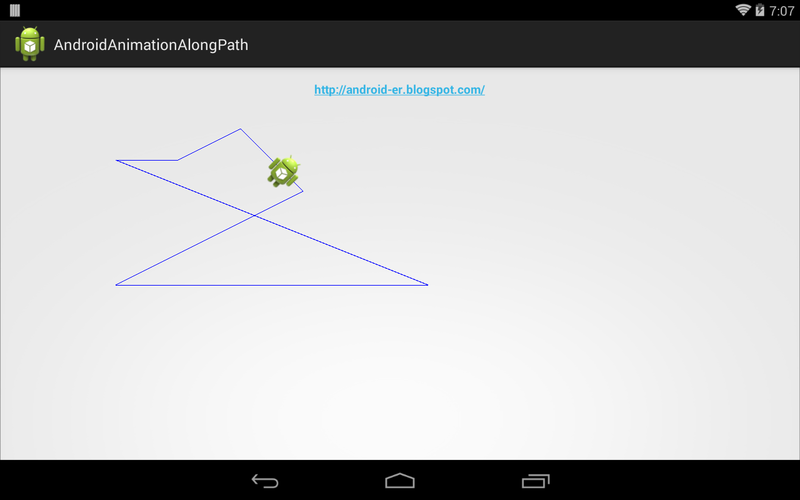 More example of Drawing Path on canvas of custom View. Thanks a lot for this code. this is what i am looking for, one question in that i just create a Image move path randomly and it will working fine, but how can i move multiple images on that path can u please help me to solve this issue...? Thanks a lot for Excellent coding, i try your updated code and my work is almost complete. once again thanks. i just change in your code as per my requirement, but i want a little help from u,i just send u prepareThings() for what i have changes done in this method. as u can see in above code, i just create path randomly and move image is it OK? but when i increase a size of bitmap more then 50 then the move animation is getting slow, can u please tell me why this is happening..? It seem that the code canvas.drawPath(thing.animPath, thing.paint) inside onDraw() run slow, remove it if not need. as per your suggestion i just comment the line which is u notify me, but the result is there is no any image and path not draw and move on canvas. just more brief explanation, i want to create something like that http://emojisandearthporn.com, is it possible in android if it is then how, please guide me.. Very clear and useful code!